CPAC Update – Wayne LaPierre | Virginia Right! 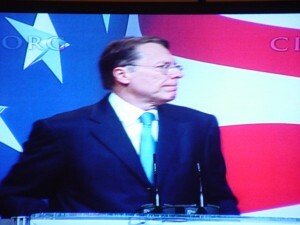 Wayne LaPierre is still fighting for our rights under the second amendment. The Obama administration has been lying about the source of arms in the hands of Mexican drug lords in an attempt to ban more weapons. LaPierre has exposed these lies with absolute proof, something the Obama administration fails to show. A number of video clips from 2000 and before. Wayne LaPierre took some heat for his stance that Bill Clinton and Al Gore were allowing deaths in order to blame the NRA and guns, while not enforcing existing laws. He received cheers for standing by his statement. Tim Russert turned beet red, but the NRA leader held his ground and has been completely vindicated by programs like Richmond, Va. implemented and cut gun deaths by 40%.